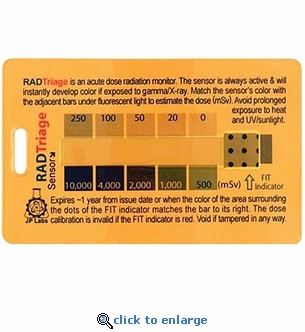 The RADTriage Radiation Alert Dosimeter Card can instantly detect radiation exposure in the event of a nuclear power plant accident, dirty bomb, or any other source of radiation. This credit card sized radiation detector fits in your wallet or badge holder. The sensor strip instantly turns darker when it detects elevated radiation levels. The darker the sensor strip, the higher the radiation exposure. No electronics or moving parts, reliable, rugged and useful for triaging radiation exposure and determining medical treatment. Field tested by Dept. of Homeland Security. Fits in wallet or badge holder. 1 Year Shelf Life Guaranteed. Extend shelf-life up to 5 years by storing in freezer. Credit card size: 3 3/8" x 2 1/8"
Quote from DHS Report - "If routinely carried by emergency responders, it could provide early indication of a significant radiation component after a terrorist event and measure individual responder dose for planning lifesaving operations. It could also reassure first responders of a lack of radiation, which could avoid response delays due to fear of radiation. Pre-distributed SIRADs [RADTriage] could provide early data on the ground to assess the scope of a radiation event. This data could assist identifying those in the public that potentially received a significant radiation dose." Quote from DHS Report - RADTriage was found to demonstrate "acceptable performance for homeland security mission needs. If routinely carried by emergency responders, it could provide early indication of a significant radiation component after a terrorist event". Quote from DHS Report - "The SIRAD [RADTriage] demonstrated generally acceptable performance for homeland security mission needs. Incidence of loss or damage to the device during field deployment was low, false positive rates were less than one percent, and field conditions and physical stresses did not seem to compromise performance."